Adapted from “The Latest on Managing Bot Canker and Blight – 2015 Research Updates” by Janine Hasey, UCCE Farm Advisor, Katherine Jarvis-Shean, UCCE Farm Advisor, and Themis Michailides, Plant Pathologist, UC Kearney Research and Extension Center, published in Sacramento Valley Walnut News, Spring 2016. 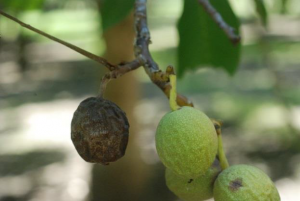 Botryosphaeria (Bot) canker and blight of walnut continued to be a problem so be alert to new infections from this spring and summer. Bot reduces yields by killing small fruit wood and large branches and directly infecting the nut. It is most obviously seen in walnut orchards as blighted shoots (dead branches with the leaves still stuck on), blighted twigs (dead, darkened and shriveled) and fruit with the entire hull blackened but still on the tree. Fruit can also be infected early in the season from latent infection, but the tissue death won’t be visible until late summer/early fall. Blighted fruit caused by Bot. This photo was taken in early September 2014. Photo credit: T. Michailides. Bot fungi infect the nut, move into the peduncle (nut stem), and then kill the spur and next year’s buds. Bot can enter through wounds such as leaf scars, bud scars, and peduncle scars, pruning wounds, blighted fruit and scale infested wounds. Cankers grow slowly when temperatures are low. Above 80°F, cankers grow in 7-10 days. Leaf scar infection. Photo was taken in fall 2014. Photo credit: T. Michailides. There are two types of spores – the more common water-borne pycnidiospores, and the wind-borne ascospores. Practically-speaking, this means Bot can spread by spores dripping and splashing OR by blowing around in the orchard, depending on spore type. Both types need water to trigger infection. The photo below shows Bot spores oozing out of pycnidia (spore bearing structure) that have grown under the surface of infected wood. Bot infection requires susceptible tissue, infective Bot spores and the right environmental conditions – at least ¼” of rain (or irrigation water directly on susceptible tissue) and temperatures at or over 50°F. Pycnidia oozing toothpaste-like spores. Photo credit: T. Michailides. Pruning wounds in medium-to-large wood (3- and 4- year old branches) are susceptible to infection for at least four months after the pruning cut is made. Dr. Michailides pruned branches in early February and inoculated with Bot spores at different intervals over four months. 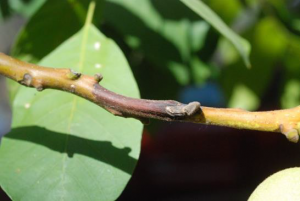 For one- and two-year old wood, cankers that grew from pruning wounds were no different in length from the control, indicating that pruning does not make these tissues more susceptible to Bot. However, three- and four-year old wood had much longer cankers than control branches even up to four months later. It is suspected that the hollow pith inside older walnut branches provide a haven for infection and spore growth. Spraying fungicides on pruning wounds did not consistently reduce infection. Chipping pruned wood reduced ability to cause infection by two-thirds, but removal is still best option in light to medium infected orchards. In a Solano County trial, infected dead wood was pruned, chipped and left on the orchard floor, then sampled regularly for pycnidia presence and spore viability. Chipping the wood decreased pycnidia presence by 2/3 below those in the unchipped control by the end of the season. However, an average 30% of the pycnidia on chipped wood could still produce spores with almost 100% viability by the end of the summer. More research is needed to determine whether pycnidia will overwinter in chipped prunings following winter rains. Because of the large size of walnut trees and fruitwood distribution, we recommend both cultural and chemical controls. Avoid sprinkler irrigation that wets the canopy and also spreads the disease. Control scale insects that may provide entry points for disease. Prune dead branches back to healthy green wood during the summer or immediately following harvest allowing at least one month before heavy rains can spread inoculum to susceptible pruning cuts. Removing infected wood from the orchard floor can reduce the inoculum load and is mainly important in orchards with light-to-medium Bot infection. Finally, apply a fungicide spray mid-May, mid-June, and mid-July to reduce Bot infections.